Hand painted resin and metal cane. 3.5 x 4.8 x 35.8 inches. 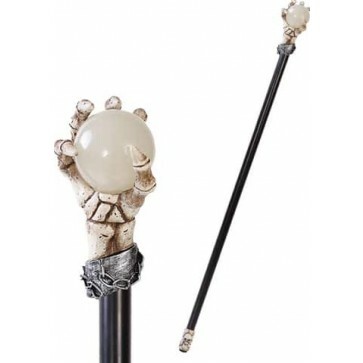 Skeleton hand with a magical orb ball walking cane. Don't worry, skeletal parts are not real. The magic of the orb, on the other hand, may very well be depending on the cane user's mastery of energy. Bring an element of the macabre to your daily neighborhood strolls and soon a dark trail of gorgeous goths in their sabbath's best will be following your lead. Guaranteed. Please note: This cane is for prop and show purposes only. It is not medically approved to support any weight...except for maybe that of your pimping hand. 3.5 x 4.8 x 35.8 inches.